The only problem with a romantic break in Florence, Italy, is that you might be tempted to shun your lover for the city itself, such is its allure. But if you stay true to your special someone, then you could find no backdrop more conducive to an amorous getaway. There is a huge choice of hotels available, from the budget to the grand. But you won’t have to spend too much for suitably romantic accommodation – especially if you avoid high season, or are prepared to stay a little way out of the centre. Even if you spent a week here strolling the many Renaissance squares (piazzas) and narrow cobbled streets, you would only see a portion of the secrets of Florence. However, for those with limited time, head for the Piazza della Signoria. Here you’ll find the grand Palazzo Vecchio with its iconic tower. Nearby you’ll see a copy (though a very splendid one) of Michaelangelo’s David. Enjoy the atmosphere in one of the numerous cafes edging the square. After topping up your Italian coffee reserves, wander towards il Duomo – the Cathedral of Santa Maria del Fiore. 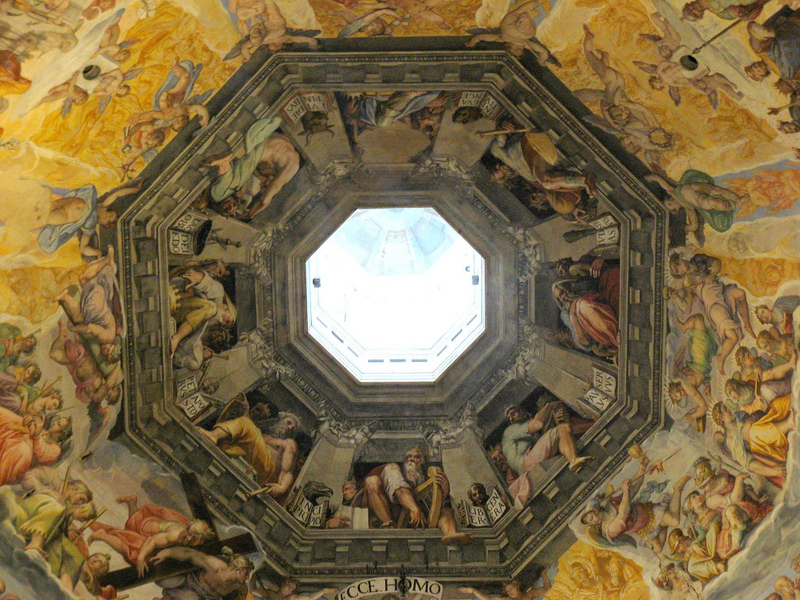 No doubt you will have already seen its majestic dome from afar – dominating as it does the entire Florentine skyline. Big enough for 20,000 people, it is well worth the effort of looking inside. The outside, however, is equally breath-taking. Make sure you take in the splendour of the Campanile – or Bell Tower – also located in the Piazza del Duomo. Next, take a stroll over to the 11th Century Baptistery of John the Baptist, built of stunning green and white marble. Its three large, beautiful bronze doors make this is one of the most unique buildings in the city. It is located in the Piazza San Giovanni, just off the Piazza del Duomo. 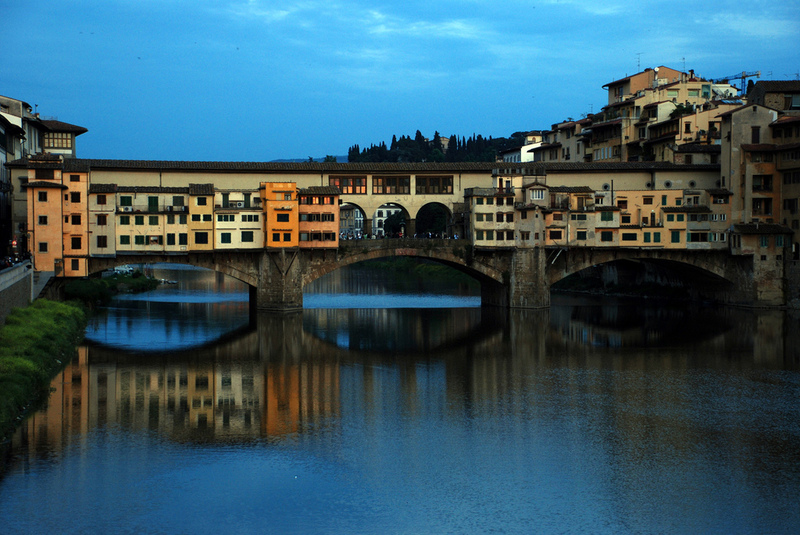 After this, move southwards to the unmissable Ponte Vecchio – a medieval bridge on which there are still shops selling jewellery. The perfect place to buy your loved one a token of your affection? Another must-see is the Galleria degli Uffizi which boasts the world’s greatest collection of Renaissance art, but buy your tickets in advance since queues are long and may add a little too much tension to your romantic escape. After consuming all this architecture and art, you will probably feel the need to consume some of Italy’s famous cuisine. But, before you and your loved one dine, why not head back to the Piazza del Signoria and enjoy the sunset with some Tuscan wine? When it comes to eating, strolling the cobbled streets in search of a restaurant is a joy in itself, with every type of food imaginable on offer. But classic Tuscan cuisine is the order of the day. After your romantic break in Florence it won’t be long before the capital of Tuscany beckons you and your partner back for a little more amour. This entry was posted in Single Trip Travel Insurance, Travel Advice on February 6, 2014 by worldwideinsure.